After tying in the regular season with picks, our NFL season has come down to the final 3 games. I am currently 6-2 while Matt sits 1 game back of me at 5-3. A bar tab is at stake here. The last time we had this bet, Matt took it down, and he ran up the tab on me. If I can hold my own in these last 3 games he can expect me to reciprocate his actions from 2 years ago. Colin Kaepernick was scary good last week against the Green Bay Packers. He was a man among toddlers out there. Sure Kaepernick runs like a gazelle, but he also has a howitzer for an arm. The Atlanta defense does nothing to make me think he won’t have a similar performance come Sunday. On the other side, I fully expect Matt Ryan to deuce his pants when he gets under center and is staring into the eyes of Patrick Willis and the 49ers defense. He was very fortunate to escape last week against the Seahawks. I don’t think he will be as fortunate this time around. It comes down to this: I’m up against the wall, being one game down with only three to go. I have more confidence in the 49ers taking down the Falcons than I do the Patriots rolling over the Ravens. But, that makes it sound like I’m nervous about the Pats game. In all honesty, I’m not, I just think the Falcons have absolutely 0% chance to win. Ok, to the game. Kaepernick isn’t an amazing quarterback, but he is a game changing athlete. The one question I always find myself wondering is why doesn’t anyone hit this kid. Yes, I know he’s fast and elusive, but there comes a point in time where you need to surrender the 15 yard penalty to ring this kids bell and send a message. Sadly for Atlanta, their defense doesn’t have anybody capable of getting the job done. I expect Atlanta to score 24, but I think the 49ers will score more. For some odd reason, I am more confident about the Patriots playing the Ravens than I was when they played the Texans last week. I fully expect the Patriots to run their hurry up offense all game long. The Ravens defense will not be able to keep up. They have played a lot of football these past two weeks, are banged up, and getting old. The Ravens will come out with their adrenaline pumping playing off the momentum from last week’s emotional come from behind victory and the idea of this potentially being Ray Lewis’ last game. Once that emotion wears off, the Patriots will take control of the game. I expect the Ravens to take away the middle of the field, allowing Brandon Lloyd to have a big game. If I go 0 for 2 in these picks, we are looking at a beyond boring Super Bowl. Patriots vs. 49ers is the exact opposite. What an awesome game that will be! Pure necessity forces the Baltimore pick here. Again, I have absolutely no confidence in Atlanta, while I have a sliver of confidence in the Ravens. Hence, you find me going with the Flaccjacket himself, Mr. Choke Artist, the ugliest quarterback in the game, Joe Flacco. 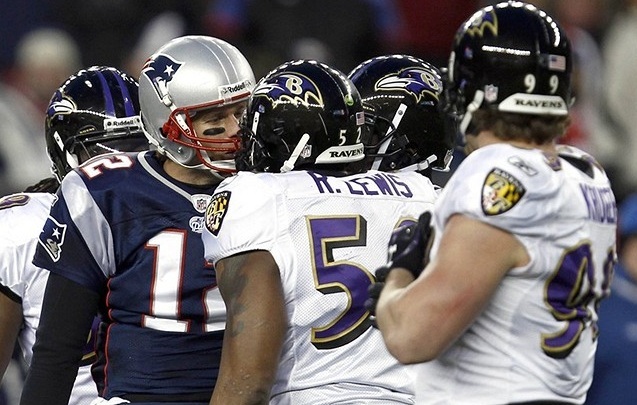 The Pats have been playing well as of late, but so have the Ravens. You can never underestimate the power of motivation and inspiration. This Ravens team has it because of the impending retirement of their defensive leader. I am having flashbacks to the 2010 AFC Divisional Round when Ray Rice ran all over the Patriots en route to a Baltimore victory. Ray Rice is the key to the Ravens success. Keep Brady off the field, that’s Baltimore’s only hope.